Ethiopia suspended two athletes today from any competition on grounds of doping. 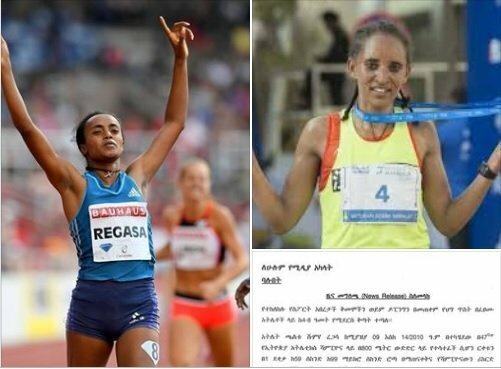 Ethiopian News Agency (ENA) reported that Chaltu Shume(left in the above picture), middle distance runner, and Birtukan Adeba(right), a long-distance runner, are suspended for taking performance enhancing substance. Ethiopian Anti-Doping control office disclosed today that the above-mentioned athletes have used banned substance to enhance their performance. Chaltu Shume’s 800 meters new record from last year is disqualified and she will not be able to take part in any competition in the country or abroad. Ethiopian Athletics Federation also wants her to return the medal and financial award she got from the competition. Birtukan Adeba was earlier suspended for doping in connection with Shanghai Marathon in 2016 and was suspended for it. The Athletics Federation added that she indulged in another round of ethical code violation as she took substance during this years/ Muscat Marathon, according to ENA’s report. She will be able to compete for eight years. Her results from the race is to be cancelled and she will also return the earnings from the race.